In attempt to alleviate my own withdrawal symptoms now that the Tour is over, I thought I’d do a somewhat tongue in cheek review of the Tour, styled as the Tour Oscars – the winners and losers from France. It’s been an epic Tour, at least in as far as trying to post on it goes! 18 articles, 100,000 visits, and maybe 200 comments in the last three weeks, and I’m ready for a holiday from cycling myself (imagine what a cyclist must feel like). But the first Oscar goes to everyone for their inputs and comments, for contributing to the discussion and debate (sometimes the arguments) and for enriching the site with informed opinions! A particular thanks to Alex Simmons, who has commented maybe a dozen times, always with inputs and calculations of power output and performance analysis that helped enormously with the discussion. But to everyone, thanks a million and hopefully the end of the Tour won’t signal the end of your input – there are still swimming and athletics analyses to be written! I’m going to split the award for best performance, and say that it goes jointly to Mark Cavendish, and of course, Alberto Contador. Cavendish almost had a perfect Tour. It was perfect from the point of view that he won every single sprint he competed in – six out of six. When Mark Cavendish was in the group with one kilometer to go, he won six out of seven stages – the only occasion he did not win a stage was on the ride into Barcelona, when he was caught out by the final climb and never really contested in the last 300m. His “imperfection” was in failing to win the green jersey, something he has blamed on the decision to disqualify him on stage 14, which gave Thor Hushovd a big boost in points. To his credit, he has since acknowledged that Hushovd probably would have won green anyway, thanks to his superior finishes on the tougher days, and that brilliant ride in the Alps that saw him garner all the intermediate sprint points. So Cavendish has unfinished business in the Tour, but he’ll go down in history as the best British rider ever (in terms of stage wins) and considering he’s only 24, he may well rack up a record number of stage wins by the time his career is over. He may be brash and cocky, and not all that likeable, but he sure is the dominant sprinter – the size of his wins, more than the fact that he’s won, has been extra-ordinary. So he shares the award with the best cyclist in the world, Alberto Contador. Alberto Contador won the Tour with three moves – first was his attack on the top of Arcalis, which saw him gain 21 seconds on his rivals, but perhaps more important, leapfrog his own team-mate into the leadership position of Astana. In hindsight, it would probably not have made a difference, so brilliant was his ride up to the Verbier just over a week later, but it was a significant message and a move that apparently created a difficult atmosphere within the team. Contador, who has been accused of being tactically naive, impetuous and inexperienced, actually showed something of his ‘street smarts’ there, because who knows how the Tour may have shaped had it been Armstrong who was in a position to inherit yellow. The climb to Verbier was the decisive day in the Tour. For a week the Tour had been dormant, and suddenly it explosed and it was Contador who dominated with a breath-taking acceleration and climb. It said loud and clear to everyone else, including his own manager and team, that he was the superior cyclist, and served to set the pattern for the rest of the Tour. He would go on to mark attacks and control the race, before his third performance, the stage win in the individual time-trial, confirmed his dominance. In his own words, it was a difficult Tour, one in which he never really had the full suport of his manager or some of the riders in his team. In the post-race interview, he said the following: “The preparation for this win was rather tricky, I had elements working against me, but I kept focused,” said Contador. 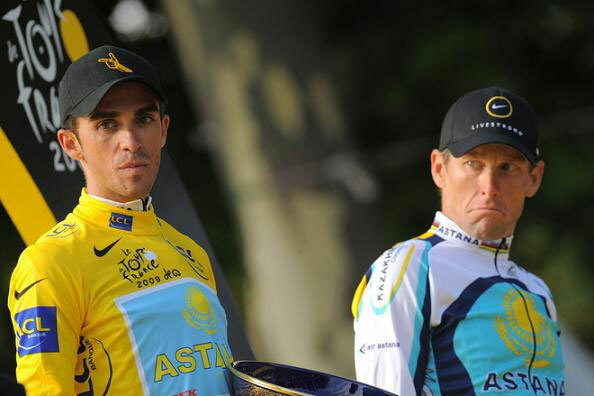 “Do I think Bruyneel wanted Armstrong to win the Tour? That is a very good question.” Bruyneel was not at the press conference to answer this question himself. It’s not only his words that testify to that, but the actions and quotes coming out from Astana throughout the Tour. It was very difficult to get a consistent message – was the attack planned? Was it against team orders? No one knows, because no consistent message came out of the team. Twitter messages laced with insinuation, quotes contrary to Contador’s, and the world’s media began to pick up a very obvious pattern (so it’s not only me suggesting this, just so you know!). Nothing seemed certain from the race’s best team. With the exception, of course, that Contador was the number one Tour rider, and a deserving winner. From that point onward, it just got worse and worse for the runner up from the last two Tours. The Alps were a disaster. He entered them well off the pace anyway, thanks to a weak team that had lost time in the team time-trial, and he continued to lose more. Contador’s Verbier attack cost him just over a minute, but it was on the day after the rest day that his race exploded, and he was dropped on the final climb of the Petit St Bernard, losing 3:55. The next day was worse – dropped on the very first Cat 1 climb (there were 4 it total), he ended up in the grupetto and his Tour was well and truly over. In the end, he finished the Tour in 30th, 45 minutes behind Contador. All in all, disappointment for Evans, who refused to comment on his form for “personal reasons”, which may or may not mean anything! A “dubious mention” goes to Carlos Sastre, who came in as the defending champion, but never really featured. He was predicted by commentators and Armstrong to be a danger man in the third week, but his only occasion to feature was on the climb of the Col de Ronne, where he attacked, and was caught within a kilometer before being comprehensively dropped. He would go on to finish 17th at 26:21 down. His other contribution was an outburst over the “lack of respect” he’d been shown in the media, but to his enormous credit, he apologized for this later in the Tour, showing class that seems to be relatively rare in cycling. Perhaps Sastre simply trained too hard, too early this year, the weight of defending the title pushing him over the edge? He was good at the Giro d’Italia, and while few would have made him a favourite, it was a surprise that he was quite so far down. Another mention to Denis Menchov – the Giro champion never featured, unless it was to show him picking his bike up after an accident. Perhaps he was a ‘victim’ of the same problem as Sastre, peaking for the Giro and then simply not having the form in France. Forget what the Tour said – they gave this award to Franco Pellizotti, for his frequent attacks and presence in break-away groups especially in the mountains. The real winners of this award should have been the Schleck brothers, Frank and Andy. Pellizotti rode well, sure, and he was aggressive, but it’s a lot easier to be aggressive when 98% of the peloton are perfectly happy for you to go on the attack, because you’re no threat to the overall GC, and are simply indulging yourself in the King of the Mountains. When you’re lying in the top 6, and you are attacking the best five cyclists in the world over and over, trying to squeeze out seconds in the race for the podium, then you are truly deserving of the prize for aggression. Andy and Frank Schleck lit up the Tour – but for their aggression, the race would have been a procession, with Contador putting himself firmly in the lead in Verbier. The Schlecks promised to attack in the Alps, and they did exactly that. Even on Mont Ventoux, with the Tour title all but secured, Andy made no fewer than 20 accelerations. Contador was good enough to mark them, but the Schlecks are easily the most combative and exciting climbers to watch. So Pellizotti may be the official winner of this award, but it should be given to Andy and Frank Schleck. One of the worst accidents in many years was that of Jens Voigt – he basically lost his grip on the handlebars, and fell face first onto the tar at 80km/hour and skidded for what looked like 50 m before coming to a halt. A fractured cheekbone and concussion, and what must be the worst road rash ever were the injuries, and it could have been far worse, so here’s hoping he recovers well and is racing again soon! On the whole, it was not a Tour with many big accidents. Levi Leipheimer was the biggest ‘casualty’, breaking his wrist bone in what seemed a fairly innocuous fall. Boygues Telecom had a pretty impressive co-ordi accident during the team-trial, with four men riding off into a field. Denis Menchov fell off often, compounding his poor Tour, but overall, not as eventful as some Tours regarding crashes. This goes to us, and just about everyone else who would love to fully analyse the performance’s of the worlds’ best cyclists. Cycling is a sport that really does lend itself to analysis – power output data, gradients, inferring from lab studies, and endless debates about heart rate, speed and performance ability. All of them are within reach, but frustratingly, impossible to access in a meaningful way. The folks over at Training Peaks do a fabulous job of monitoring cyclists, and you can track a couple of Tour riders on their site – well worth a read, and a brilliant system for scientific analysis. These are fascinating questions, but unanswerable for the most part – too many ‘ifs’ and ‘buts’, too many factors unaccounted for. We’ve done our best to bring you the insights, the implications and the analysis, but unfortunately, definitive conclusions remain just out of reach. Perhaps some day it will be compulsory to publish power output data, I certainly see a great deal of value in it. Until then, we can only speculate and surmise, debate and discuss, based on the best case scenario! And that’s exactly what we’ll do! Thank you once again for following our Tour de France coverage for 2009! It’s been a tremendous race to analyse and discuss, and we promise that we’re not done with cycling – whenever the opportunity presents, we’ll come back to it, because there are so many unanswered questions and topics for discussion. But for now, our attention shifts to the pools and tracks of the world, for what is hopefully equally intriguing discussion! P.S. Feel free to nominate your own “Oscar” winners – I had to stop eventually!